Unless your running style is absolutely perfect, your step will be constantly affected by either over-pronation or supination, (a tendency to land, and lift off, on the outside or inside of your foot) which risks stressing the joints and ligaments. X-Socks Marathon Socks have a unique Supination Bandage that holds the foot in a stabilised natural rolling movement to keep the runner better protected and running more efficiently. 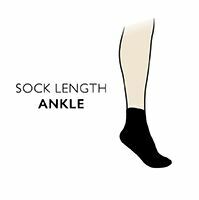 Ladies X-Socks benefit from a specialised fit , with a broader front section, slimmer, higher middle and a smaller heel, with cushioning appropriate to it. Together with the other incorporated X-Socks technology, such as AirConditioning and AirFlow channels that keep feet fresh and cool, ladies X-Socks Marathon Socks make perfect running partners.